The products created by the swedish artist and designer Nadja Wedin are loved and widely spread in her own country since she started her brand in 2012. Nadja Wedin gets the inspiration for her colourful designs from walks in the nature, that is pictured in a very personal and individual style. 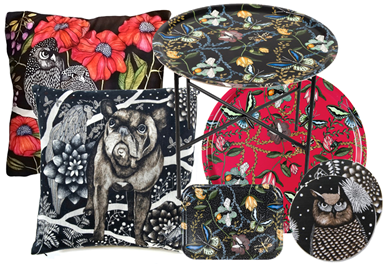 Beautiful items for kitchen and living room is to be found in her collections, such as trays, foldable tray tables, trivets and coasters, as well as cushion covers in smooth velvet and Cotton.